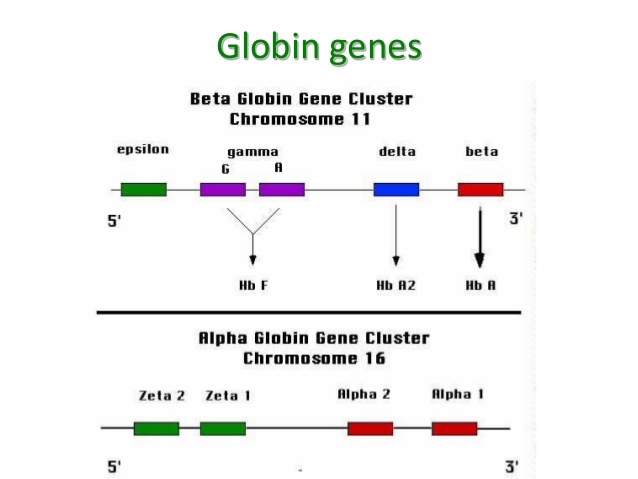 Thalassemias are inherited disorders in which there is an abnormality of one or more of the globin genes leading to reduced globin protein production. There is, therefore, an imbalance of ß:α globin chain synthesis leading to globin chain precipitation, ineffective erythropoiesis and hemolysis. Attached to each chain is an iron-containing molecule known as haem. Oxygen is transported in combination with the iron molecule of the haem group (this is an oxygenation reaction, not an oxidation). This occurs when both ß genes are Thalassemic. Anemia develops at about 2 months of age (after HbF⇒HbA switch). Untreated there is failure to thrive and physical retardation. 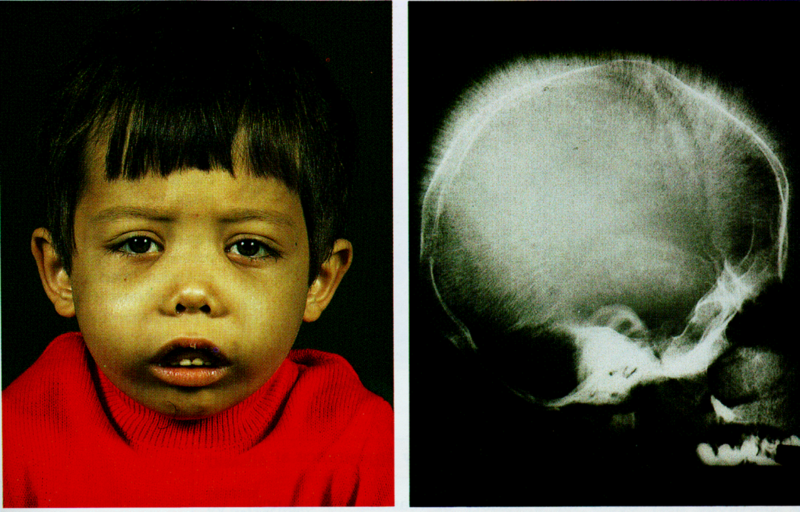 The child develops bossing of the skull, ‘mongoloid’ facies and hepatosplenomegaly. Plain skull X-ray shows the classical ‘hair on end‘ appearance. The maxilla may overgrow with prominence of the upper incisors, and separation of the orbit. These produce the characteristic thalassemia facies in thalassemia major. Death usually occurs in childhood if untreated. Affected individuals have only one affected ß gene. Anemia is either not present or very mild. This is a heterogeneous group of disorders in which both ß genes and sometimes one or more ∝ genes are affected but the disease process is relatively mild with no transfusion requirement and little physical retardation. The Hb is variably reduced. The RBCs are invariably microcytic in all types of the disorder. 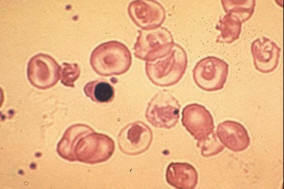 In the disease state target cells, stippled cells and nucleated RBCs are seen in the blood film. In ß thalassemia trait, HbF is usually normal and HbA2 is slightly raised (5%). In disease, there is increased HbF and HbA2. 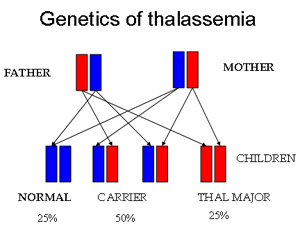 HbA may be absent in homozygous ß thalassemia. Only one of the genes is affected and a slight reduction in the MCV is the only abnormality. Two or three ∝ genes are affected and individuals may be asymptomatic or mildly anemic. All four ∝ genes are involved, leading to inadequate HbF production with intrauterine death. The MCV is reduced and HbH (ß4 tetramers inclusion bodies) may be seen in RBCs. Electrophoresis shows the presence of HbH (not in silent form) and there may be a small amount of Hb Barts, especially at birth. In hydrops fetalis there is no HbA, HbA2 or HbF; only Hb Barts and some embryonic hemoglobins. In ∝ and ß thalassemia trait problems usually only arise with infections or during pregnancy. Folic acid is usually given throughout pregnancy. It is important to prevent patients being given iron supplements because of the low MCV. In ß thalassemia disease, patients often require frequent blood transfusions, possibly every few weeks. Over time, blood transfusions cause a buildup of iron. Iron chelation with deferasirox (Exjade) or subcutaneous desferrioxamine (Desferal) can help remove the excess iron. Some patients with ß thalassemia intermedia may need treatment for iron overload with deferasirox. Although most people with this condition don’t need the blood transfusions that often cause iron overload, people with ß thalassemia intermedia may have increased digestive absorption of iron, leading to an excess of iron. Splenectomy is required if the transfusion requirement increases. Stem cell transplant may be used to treat severe thalassemia in select cases. Testing can be done before a baby is born to find out if it has thalassemia and determine how severe it may be. Chorionic villus sampling: this test is usually done around the 11th week of pregnancy and involves removing a tiny piece of the placenta for molecular analysis. Amniocentesis: This test is usually done around the 16th week of pregnancy and involves taking a sample of the amniotic fluid. Borgna-Pignatti C, Galanello R (2009). Thalassemias and related disorders: Quantitative disorders of hemoglobin synthesis. In JP Greer et al., eds., Wintrobe’s Clinical Hematology, 12th ed., vol. 1, pp. 1083-1131. Philadelphia: Lippincott Williams and Wilkins. Cooley, T., Lee, P.A. A series of cases of splenomegaly in children with anemia and peculiar bone changes. Trans Am Pediatr Soc. 1925;37:29–30. Flint, J. et al, The population genetics of the haemoglobinopathies. Baillieres Clin Haematol. 1993;6:215–362.